Nothing says gourmet cupcakes quite like taking the time to put filling in them! 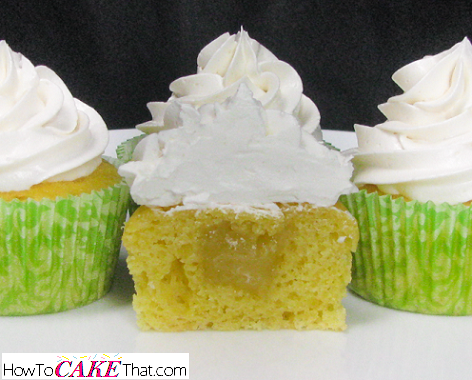 The photo above shows one of my favorite cupcake flavors - key lime! But this cupcake with just frosting and cake alone wouldn't have that WOW factor. There's only so much flavor cake itself can hold - that's where filling comes in! The key lime curd filling gives it that burst of authentic key lime pie flavor! So, how do you put filling in a cupcake? First, we will need to core the cupcake to create a cavity for the filling to sit. 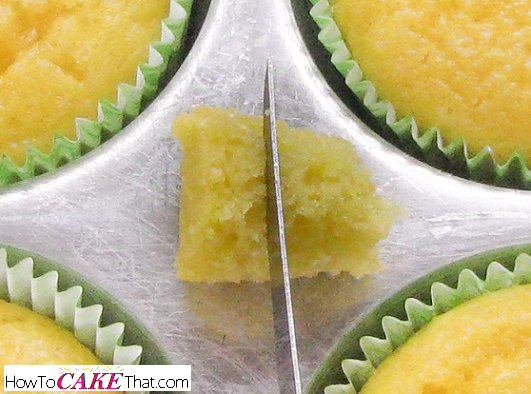 To do this, a cupcake corer tool can be used for a nice even cut, or it can be done using a paring knife. For this tutorial I'll be using the paring knife method. Begin by cutting a small circle in the top of the cupcake, cutting about 2/3 of the way down into the thickness of the cupcake. 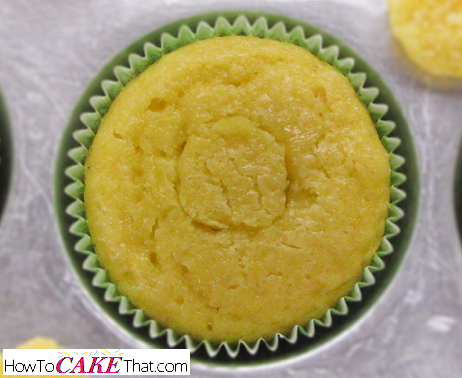 Be sure to not cut all of the way to the bottom of the cupcake, or the filling may fall out of the bottom of the cupcake when its peeled away from its wrapper. 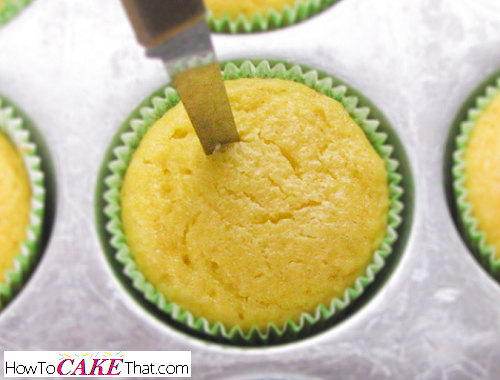 To remove the cupcake's core, I like to insert the paring knife partially down into the freshly cut seam and gently press the knife into the core and lift out, using my fingertips to help lift out the core. Now we need to make a little lid to put on the filling. 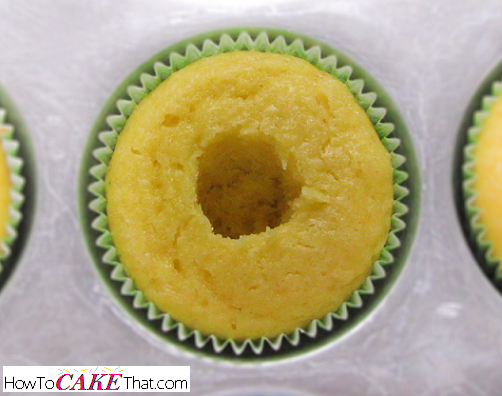 Lay the cupcake core on its side and cut the very top of the core off. This top will be used to cover the filling. Next, fill cupcake with the filling. 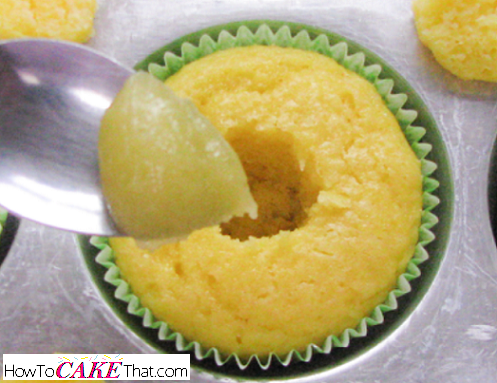 Once cupcake has been filled, place the "lid" on the filling. Now you have a nice even surface to pipe your buttercream! I hope you have enjoyed this tutorial! God bless!